Since I started this blog I noticed that virtually all my favorite pasta recipes contain fettuccine / linguine / tagliatelle and cream sauce. The only exception seems to be pasta with home made pesto. Gorgonzola sauce (and gorgonzola cheese overall) is my big passion. However like in case with pesto pasta I prefer making it at home. Somehow the home made gorgonzola pasta tastes better to me most of the time. So when I eat pasta out I normally end up choosing mushroom cream sauce which often turns out good. The dish is ridiculously simple. 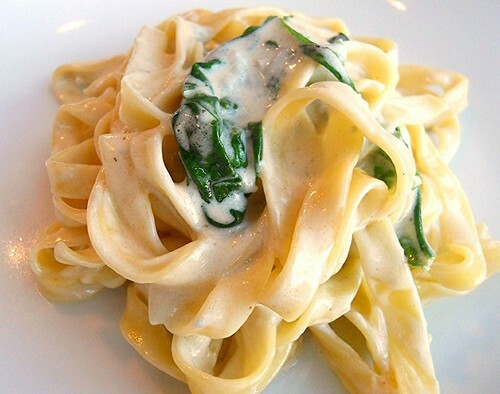 You just get proper gorgonzola cheese, good pasta, spend 10 minutes at your stove and done. You can easily skip spinach if you dislike it or don't have it at hand. Heat the oil in a medium pan. Add the garlic and fry for 1-2 minutes till the aroma gets into the oil. Throw the garlic away and reduce the heat to low. Add the cream and gorgonzola cut into pieces. Heat gently stirring till the cheese melts. Add the spinach (if using) and let it soften stirring gently. Remove from heat. Cook the pasta al dente and drain. Add the pasta to the pan with the sauce and stir to get it evenly covered. Serve immediately (the sauce looses silky texture when cools down and it happens quite fast). What mean heavy cream? Smetana?